Earlier this year Michael Kiwanuka saw off tasty competition from hot tips Frank Ocean and Azealia Banks to be named the BBC’s Sound of 2012 winner by a panel of critics who clearly saw greater long-term potential in the London-born singer-songwriter than in his more obviously hip rivals. If they’re minded to, Ocean and Banks have a right to feel aggrieved – the critics were 40 years out. Kiwanuka couldn’t be more Sound of 1972 if he was teaching the world to sing in perfect harmony. This isn’t pejorative. It’s not as if Kiwanuka is weeping salt tears over his Puppy Love or co-opting the Pipes and Drums and Military Band of the Royal Scots Dragoon Guards. He’s got taste. He’s “getting it together in the country” with Steve Winwood and Traffic, or beachcombing with Terry Callier, because Home Again is a folk/soul album, warm and understated with a breath of psychedelia. It might not heave with originality, but it’s run through with a faith and sincerity that just about overpowers reservations. 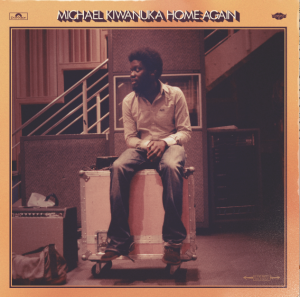 And faith is a big thing for Kiwanuka, who peppers I’m Getting Ready – relaxed and summery like early solo Paul Simon – with calls to the Lord, and makes deep promises to his brother man on the gospel-soaked I Won’t Lie. Even the less obviously devotional stuff like the slow-burn blues of Worry Walks Beside Me, the Moondance-era Van Morrison of Rest or the mariachi jazz of Always Waiting has the feel of a kind of pilgrimage – Kiwanuka is perpetually on the hunt for something, peace of mind, relief, the return home. Produced by The Bees’ Paul Butler, the album betrays hints of the Isle of Wight analogue dandies’ free spirit in its more abandoned moments. Opener Tell Me a Tale is a glorious combination of fluttering jazz flute and Tempations swing, while I’ll Get Along – with its nifty, crystal guitar and louche handclaps – is a quiet riot. But all this spiralling through folk, soul and jazz settles on Kiwanuka’s voice, a rich, weathered instrument that appears to carry more than 24 years’ experience. If the occasional song is man-and-guitar by numbers, he’s got the cords to conjure a bit of depth, whatever the decade.